The last thing I feel like doing right now is decorating for Christmas. The choatic state of my kitchen has something to do with it. I wish I had doors to close this room off, but I don't. Insead, I have two large openings to my living room. Yay! This really shouldn't keep me from spreading the holiday cheer throughout the rest of the house, but it does. Yes, we're insane for taking on a DIY kitchen remodel during the holidays. And yes, we have messy cabinets (that I get to look at every single time I walk into the kitchen - and see from the street through the windows). 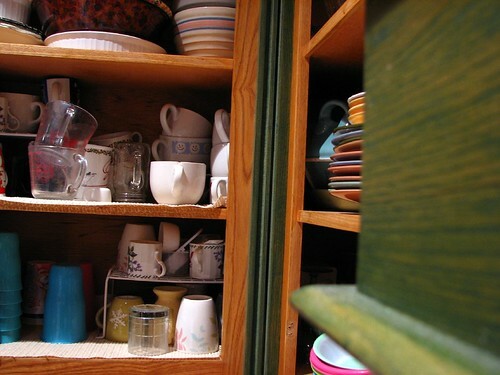 Not being able to close cabinet doors is driving me crazy! I know that once my two-toned freakazoid kitchen cabinets are painted white it will all be worth it, but until then I'll be in a slightly foul mood, okay? Are you sick of this dress yet? I finally dressed Miss Ava Rose in it today, so I had to share. Couldn't you just eat her up? I could, even with her constant recital of "poo-poo...tee-tee". 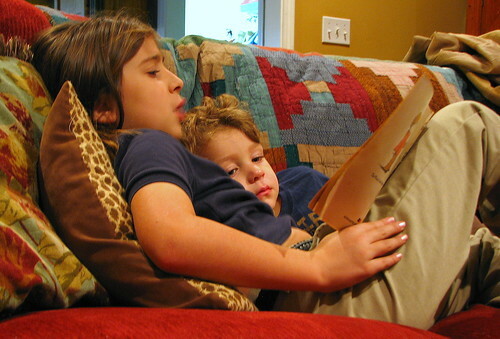 It gets a rise out of her brother and sister every time, therefore, she says it more. Lucky us. I could live on wine, bread, and cheese....and salad (gotta have some greens). My mouth is watering just thinking about it! I tend to wear mostly solid colors. The only place I like to wear patterns is on skirts - with a solid colored shirt. I have a small scar on my upper lip from when I was a child. My mom had me wrapped up in a towel after a bath and I slipped on the bathroom floor. I guess I fell face first. That was my first stitch (I think, I have no recollection of this, only the scar). I have have a big head. This is new to me. I just learned this while having Ava's huge noggin checked out by the neurologist (the kid's head is REALLY big). The Dr. measured my head then told me that she gets her big-headedness from me, as my head measured at the top of the charts too. I find it interesting that I've gone my whole life without knowing that I have a big head! Bodily smells gross me out (hair, breath, feet, BO, etc.). Yuck! I like the smell of soapy cleanliness and laundry detergent. I have very strong fingernails that I like to keep short. I can't stand when my nails get too long, it drives me nuts. Shannen Doherty's asymmetrical face bugs me. That girl creeps me out! I can't stand to look at her. Feel free to play along, or tell me to shove it - your choice. Tee-hee! I think I'm supposed to tag 8 people, but because this was a 5 and 8 combo, I'm choosing 7. My reasoning is that the average of 5 and 8 is 6.5, and I can't choose 6.5, so I rounded to 7. Good enough? Okay. I’m ready to try something new. For quite some time now I’ve had the desire to put paint brush to canvas, but I’ve been afraid. That seems silly, doesn’t it? Yes, I have painted before, but nothing more than just playing around with the kids, simple little projects that we finished in an hour or two. I’ve never painted anything that was reflective of me. And that’s why I’m afraid. Back in college, I took a drawing class. I can’t draw squat, but this class was a requirement for the design curriculum that I wanted to follow. That class was painful. I had no idea how hard it would be. The first few weeks when we learned the technical stuff was okay, but once we got to the point where we were creating “art”, it got hard. It was hard to come up with a good subject matter, hard to have a good composition, and extremely hard to take the critiques. Oh, those critiques! Near the end of the class, after being extremely frustrated by not having my drawing chosen as one of the top ones to be displayed, I got fed up. I went to the library and checked a few books out on abstract drawing. At the next class I continued working on my piece from the previous class, but I covered the entire drawing in black charcoal. I thought “screw that still life, I’m going to abstract it!”. And that’s what I did. At the end of class I can clearly remember my instructors words, “Rebeka, you’ve had your breakthrough!”. YES! That drawing was chosen as one of the top ones. That felt good. What I learned through that experience is that when you’re creating art, you have to listen to yourself. It wasn’t until I broke away from what I thought the teacher wanted and tried something on my own that I had success. As I was working on that piece, I could feel it. It really is an amazing feeling. I want to feel that again. I still have that “breakthrough” piece. For a long time I couldn’t look at it. 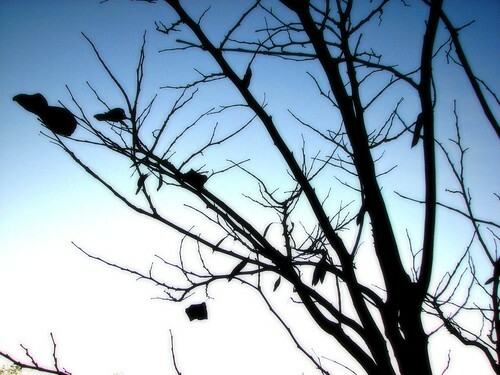 When I did, I saw frustration, insecurity, embarrassment, and lots of darkness. On a recent visit to my husband’s class room I noticed that he has that piece displayed. It’s funny how that piece looks different to me now. It’s not so bad. Yes, it is still a little embarrassing, but I can live with it. Over these last few years while keeping up this blog I’ve come to know myself a little better. Sharing my projects and reading about yours has brought my own design aesthetic into focus. 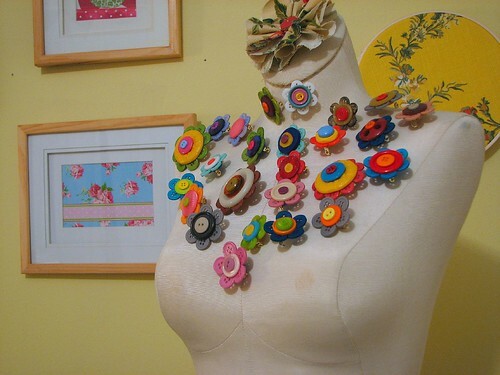 I know that I like color and texture, it’s a recurrent theme in the fabrics, projects, yarns and photos I’m attracted to. I still don’t know what I want to paint, but I have a direction. As revealing and painful that it might be, I also know that it will be extremely rewarding. I’m ready to take that next step. Hopefully after the first of the year, once I finish up all my loose ends (the bazillion bags I’m in the process of making), I’m going to take a little break from sewing to focus on painting. 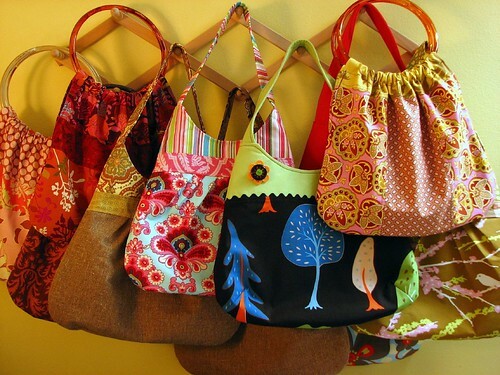 Wait, I know myself better than that – I’ll cut back on sewing to focus on painting! Yes, that I can live with! 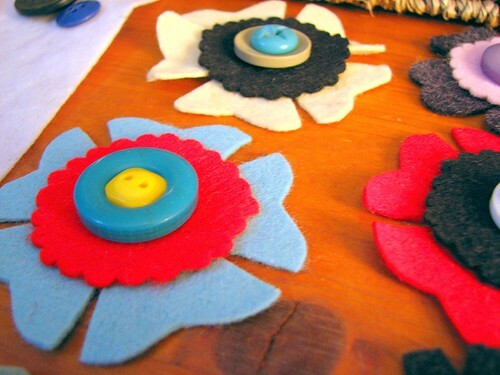 I'm still in love with my buttons, only now I'm combining them with wool felt. Ahh, can you stand it? I can't stop myself, really. I want to cut and cut, and sew and sew. This stuff is so freakin' addictive! I'm sure some of these will make it to the shop, but most of them will be toppers on gifts. Won't they be pretty on a wrapped package? A gift on a gift. With this batch I did a little more digging in my "good" button jar, which consists mostly of vintage buttons. 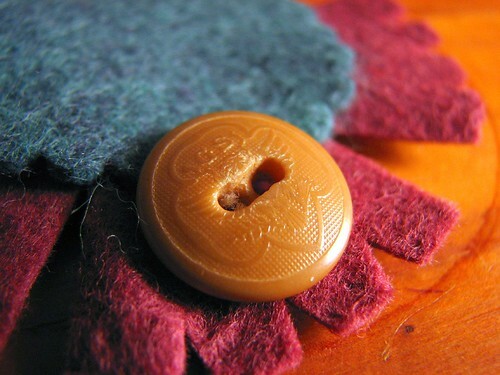 I love to think about what garment these buttons once adorned, and who they belonged to. It's easy to get lost in that. Look at this one, an old Girl Scout button, I believe. It's been a while since I was a Brownie, but I'm pretty sure I recognize that emblem. I tried looking it up on the Girl Scout website, but everything has changed. (Lori, am I right?) So cool! Better? I think so. Not only does it look better, it now fits! After sleeping on it, when I woke up this morning the dress didn't seem so bad to me, but I knew that there had to be something I could do to make it better. Then it hit me - take out the extra length from an empire seam. So, I chopped the dress in half at chest level, cut about 2.5" off from the bottom half, then sewed them back together with a band of the reddish fabric as trim. Because the skirt half was wider that the top half, I made a little pleat at the center front - you all know I have a thing for pleats. Y'all, I'm so happy I saved this! Now I can't wait for Ava to wear it. With the pockets gone, I don't think the bird looks so odd anymore. I think the band of fabric under the bird helps him stand out more, don't you think? Perhaps not competing with those pockets helps too. Whatever the reason, I'm happy I kept the bird. See, even if projects don't turned out as planned, there's always hope. 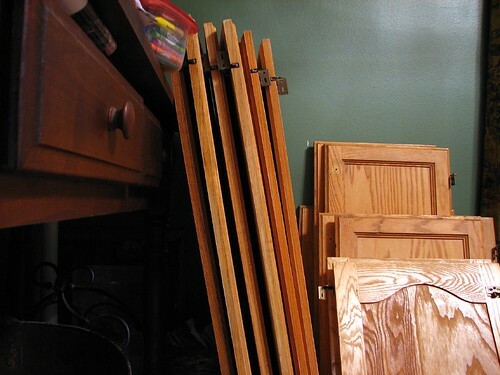 Now I want to go through my closet to see if there's anything of my own I can rework. I could get into this!! Eh, I thought this would look different. 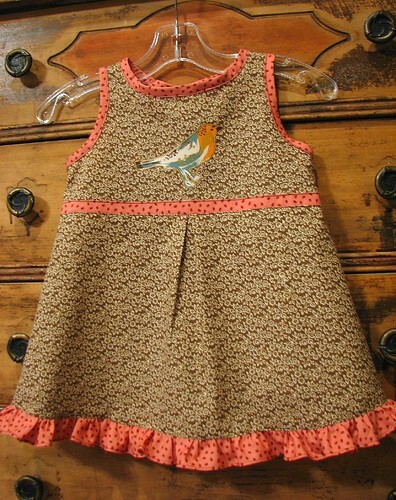 This was a little project that I came up with right after I made Ava this dress earlier this fall. It's been sitting on my 'to-do' pile ever since then. Because I was feeling a bit twitchy after having not touched my sewing machine in about a week I decided to whip it up during nap time this afternoon. 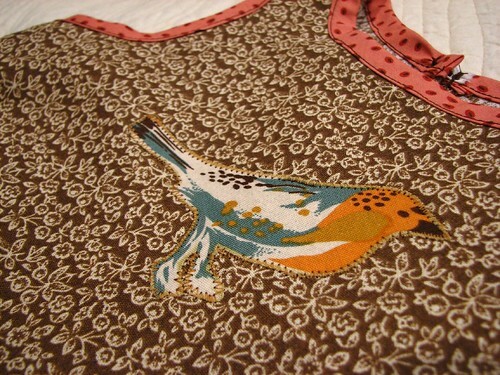 First off, this cute little bird is lost on that brown background, and I think the flowers look kind of stupid. After sewing on the appliques and feeling disappointed, I kind of didn't care how I finished it off. If you look closely, you can see that my stitching on the bias binding is totally wonky. But, I persevered and finished it, hoping that seeing it on Ava would make it look cuter. When I put it on her, it almost reached her ankles! Oh well, I don't think she'll be wearing it any time soon. Matt said it looked like an apron. 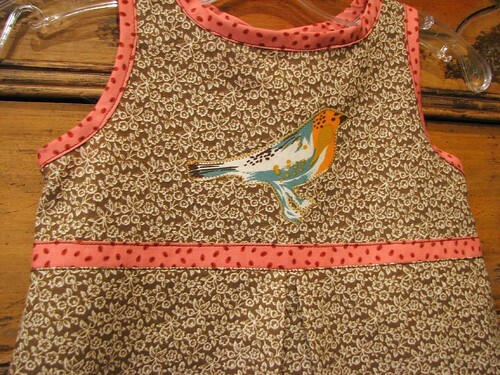 Hmm, that's an idea - maybe I should turn it into an apron? I'm not too upset about this flop. I did finally learn how to use my rolled hem foot, which was something I had never explored before. As I often tell Lily, we learn from our mistakes. Next time I'll give a little more thought to the applique and measure my subject before making her a dress. 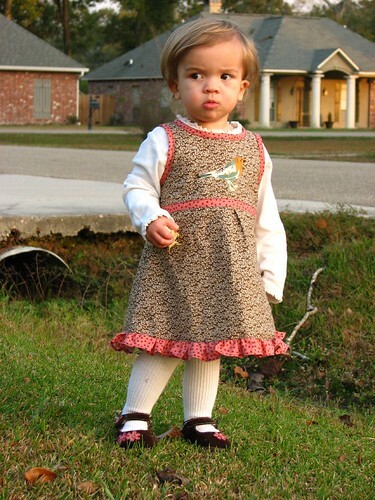 Not to sound like a total sour puss, there are things that I like about the dress - I love the color combination of the brown and red, and I love the ruffle at the hem. 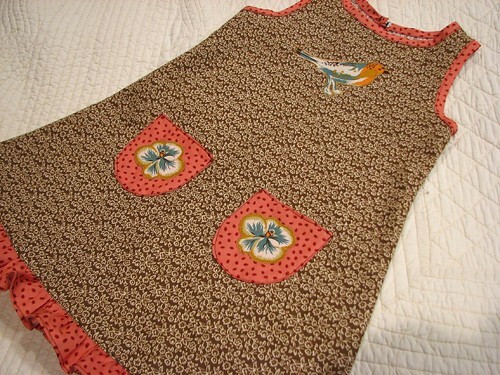 The dress would probably look better if I had done away with the appliques all together. Less is more - lesson learned! I've been a busy little bee! Check out all my hard work in my etsy shop. I didn't get around to making all that I wanted to, but I figured I had enough to do an official update. From here on out I'll just add items as I complete them. I have a couple of clutches in the works that I can't wait to share. When those get put in the shop, I'll make note of it on my sidebar. Thanks so much for all the support - I wouldn't be doing any of this without the feedback of you all!! These little buggers are addictive. When I set out to make a few on Friday night, I never imagined that I'd end up with so many! I'm not complaining, I love them all. My explanation is that it took me about a half dozen before I got in the groove, then I couldn't stop. I also never imagined that it would take until Sunday evening to finish them up. Maybe I'm just being thorough, but I let the glue dry between each layer, so, well, you get the picture. These were totally inspired by those given to me by Lori - I couldn't get them out of my mind! Thanks, Lori!! My goodness, it's been a while since I've done one of these. I don't have an excuse other than being busy and lazy at the same time. Does that make sense? You're so busy that when you have a free moment you'd rather be lazy than anything else? That's me. Bring on the lazy! Unfortunately, I can't be too lazy because I have mountains of laundry to tend to and a house to clean. My latest sewing frenzy for a shop update that I keep promising but can't seem to get to has put most of my household duties on the back burner. Oh well, that's how it goes. Once I get the house in order I can finish my shop stuff then be done with it. Can't wait!! Okay, enough about that, back to gratitude (that was the point, wasn't it?). Like last Friday, this one is a good one. This is the Friday before a whole week off for my family - lucky ducks! See, that's why I didn't feel too guilty about having this past Monday off all alone - they get the entirety of next week. I do benefit from their time off because now I don't have to get anyone ready in the morning other than myself. That means I get to sleep a little bit later - YAY! And I don't have to rush around in the afternoon picking anybody up - double YAY! The upcoming days off, when we'll get to hang out as a family and just be. I plan to stay in my pj's for one of those days, probably the day after Thanksgiving - there's NO WAY I'm leaving the house that day. 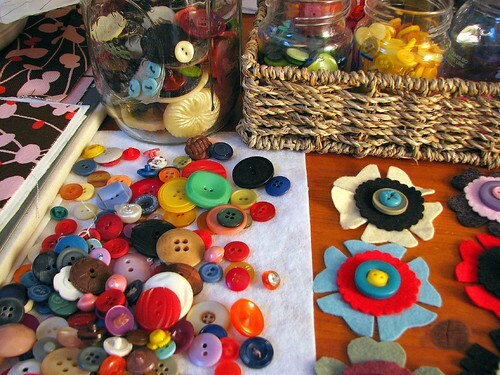 My buttons, which have been providing me with new crafty inspiration. It's nice to shift gears every once in a while. This wine - LOVE it! I first tasted this wine at the winery when we visited Napa Valley about 8 years ago. I'm so happy that my local grocery store now carries it, and has it on sale often. Martha Stewart's new craft line. Oh.my. It's definitely a good thing. I finally made it over to Michael's to see her stuff in person - I was instantly in love and in awe. If you haven't seen this stuff yet, go check it out! Okay, I guess that's it for now. Have a great weekend, all!! Besides getting ready for my shop update and helping Lily with her school projects, I've had other crafty endeavors on my mind. I'm obsessed with these little guys! 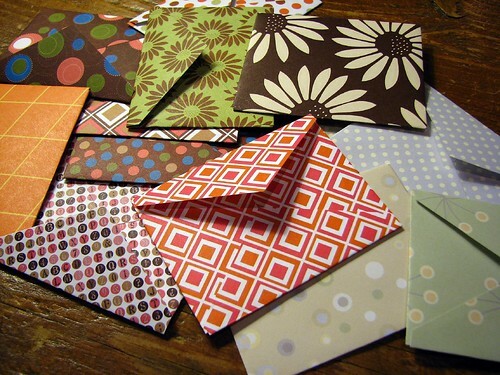 Aren't these itty bitty envelopes cute? They're a great way to use scrap booking paper, especially for a non-scrapper like me. I only set out to make a few, but I can't stop myself. If you want to make some of your own, the template is here. I shrunk it down quite a bit for my purposes. And then there's the buttons. 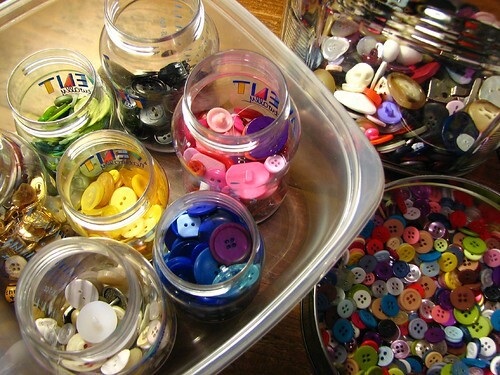 Oh, how I love buttons! I used to keep them all in a big ole jar, but now that I want to use my buttons, I've decided that they all need to be sorted. 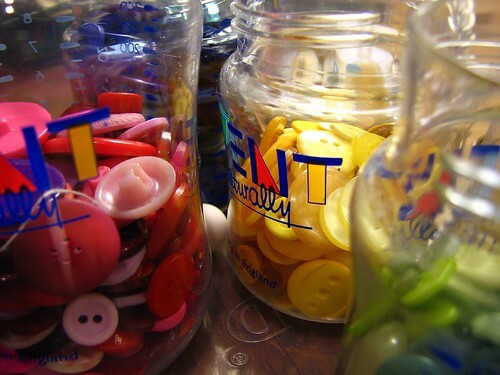 Yeah, those are old baby bottles (don't need those anymore, thankyouverymuch) - great for button sorting. 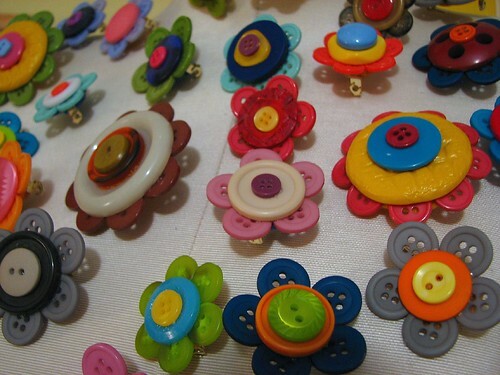 Hopefully I'll have some button creations to show soon!